I found this recipe taped to the inside of my Grandma's cupboard when I was living at "the farm," many years after she passed away. I knew it had to be good if it was worthy of such prime real estate. It had been tucked away in my recipe stash for years, until this summer when I finally decided to try it. Mmm... childhood flashback. I knew they'd be good! Bread and butter pickles could always be found in Ruby Lou's fridge. And I'm glad I found the recipe, so now they can always be found in mine. Combine all ingredients. 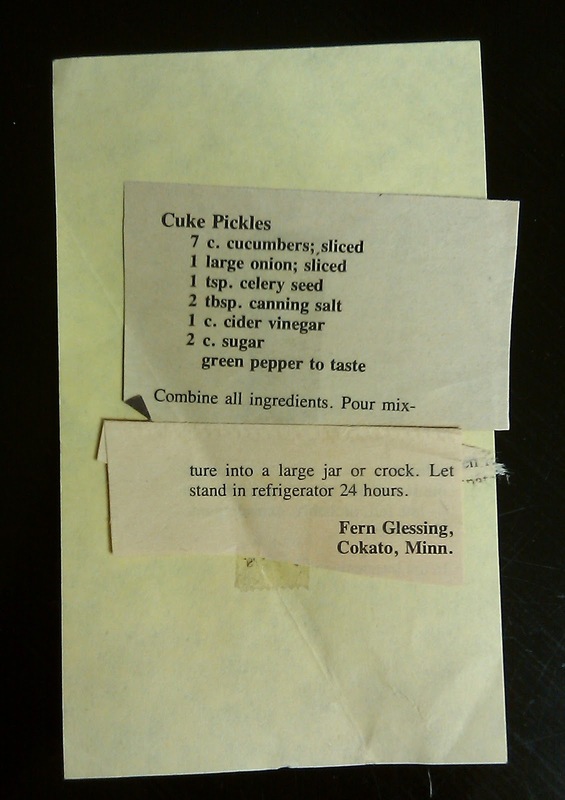 Pour mixture into a large jar or crock. Let stand in refrigerator 24 hours.